Parasailing is an exciting and unique way to experience your favourite destinations. Get strapped into your parasail and glide into the air to take in all the spectacular scenery from above. A parasailing adventure is memorable and beginners will enjoy parasailing as much as an experienced adventurer. 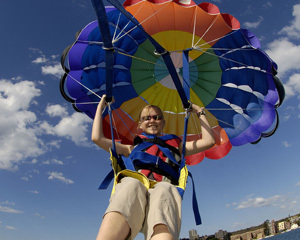 Mad About Sports has the best parasailing in Sydney, Adelaide, Brisbane, Perth, Hobart, Canberra, Darwin and Melbourne. Whether you're into a parasailing adventure on the Gold Coast, in Port Stephens or one of the capital cities, you'll find it here. Gliding in your parasail is a safe adventure that you will never forget. Jet Boat and Parasail Adventure is a great experience for anyone into high speed thrills. Experience a 55 minute high speed jet boat ride before jumping onto a another boat to experience the wonders of Parasailling. This is the best way to experience Surfers Paradise. An awesome adventure package. See the beautiful Gold Coast by air and by sea. This package for 2 people includes a 10 minute tandem parasail as well as 30 minutes of Pure Adrenalin sharing one of our powerful jetskis. Escape to Long Island for the day where you can enjoy the resort facilities, the bush walks and the beautiful tropical island setting. Come and join us for the most awe-inspiring view of the marine wonderland as we take high flyers soaring up to 100m above the water. The ballooning parachute is winched into the air from a speed boat and enables parasailers to see Port Stephens from a rare, fascinating angle. Parasailing tandem will take high flyers soaring up to 100m above the water. The ballooning parachute is winched into the air from a speed boat and enables parasailers to see Port Stephens from a rare and fascinating angle. This parasailing charter cruise for up to 30 combines the awe-inspiring thrill of parasailing with a relaxing three-hour cruise. You'll see Port Stephens from a different angle as your soar up to 150m above the water! 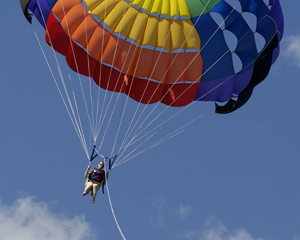 Parasailing is a breathtaking experience, perfect for those high flyers among us! Parasailing gives you the ultimate view of the picturesque Gold Coast. Fly above the high-powered boat and soak in the scenery while you experience the rush of your life. There's no need to be scared because this is guaranteed to be an exciting adventure! Western Australia's best parasail is here! Parasail for the ultimate relaxing, yet thrilling experience. Fly over the Indian Ocean towards the western sun, soaring 300ft above the pristine water. Fremantle's only open ocean parasail shows you Rottnest Island, Perth City and our magnificent coast! Parasailing is an exciting and unique way to see the Gold Coast. Parasailing combines the sheer joy of soaring in the sky one hundred metres above the Gold Coast skyline and the sensation of flying horizontally over the sea through the clear blue sky! Parasailing Sydney Harbour is a unique way to experience the Harbour and its surrounds. Better still, you don't need any experience. Come and join us for the most awe-inspiring view of the marine wonderland below as we take high flyers soaring up to 100m above the water in this solo parasailing experience! The ballooning parachute is winched into the air from a speed boat and you'll see Port Stephens from a fascinating angle! Parasail Sydney Harbour and you'll not only get an adrenalin packed thrill ride but you'll also get to enjoy the magnificent views this great harbour has to offer. Get wet or stay dry, it is up to you. Even the anxious rider will get nothing but enjoyment from parasailing over Sydney Harbour. Parasailing gives you the ultimate view of the picturesque Gold Coast.Fly above the high powered boat and soak in the scenery whilst experiencing the rush of your life. There's no need to be scared because this is guaranteed to be an exciting adventure! Parasailing tandem will take high flyers soaring up to 150m above the water. The ballooning parachute is winched into the air from a speed boat and enables you and a friend to see Port Stephens from a rare and fascinating angle high above the water! This Parasailing, Jet Ski and Jet Boat Ride for Two combines the best of air and water to give you a triple dose of Gold Coast thrills! Hang on in a jet boat, whiz around on a jet ski and soar above the world under a parasail in a sensational package that's sure to brighten your day. This Jet Ski, Parasail and Speed Boat package include a 30-minute jet ski hire and a tandem parasailing flight plus a short speed boat ride. Get set for a dose of Gold Coast thrills and experience the best of air and water during this exciting adventure. Triple the Adventure Package is a thrilling full day package including; parasailing, dolphin watch, buffet lunch and sandboarding adventure all in picturesque Port Stephens. Let your thrill seeker attitude out to play with Jetskiing, Parasailing and Speedboat Ride. Relax and rejuvenate in the exquisite surrounds and the exceptional comfort of your superior room. In the morning enjoy a lavish Breakfast of champions in Il Barocco Restaurant. Enjoy a full day adventure as you cruise to McLaren's Landing and enjoy your time at the island's resort. Try a few of the optional activities and indulge in a delicious BBQ steak and feast before heading off to explore the island's untouched beaches and natural bush land! Your child will enjoy a full day adventure as they cruise to McLaren's Landing and enjoy their time at the island's resort. Try a few of the optional activities and indulge in a delicious BBQ steak and feast before heading off to explore the island's untouched beaches and natural bush land! Take your Port Stephens sun and sand adventures to the next level! The day is in your control - parasail or sandboard first depending on your mood. Take on 50m high sand dunes in the Stockton Bight Sand Dunes system and cool off with a beautiful parasailing adventure. Experience a full day Gold Coast adventure with a difference! Jump on board our authentic tall ship and journey to our exclusive tropical island getaway at McLarens Landing on South Stradbroke Island. Feast on a delicious BBQ lunch, take a 4WD eco tour or simply relax in the peaceful surroundings. Tandem parasailing on Sydney Harbour is not only an adrenalin-packed thrill ride! While you two parasail you'll get to enjoy the magnificent views our great harbour has to offer. Get wet or stay dry, it's up to you! Even the most anxious riders will get nothing but enjoyment from this activity! Calling all thrillseekers! Experience a heart-pumping jetboat ride up the Gold Coast's Broadwater combined with the thrills of a jet ski hire or the exhilaration of parasailing. Imagine exciting 360 degree spins, awesome wake surfing and incredible Beach Buzzing in as little as 10cm of water! Triple the Adventure is the full day, all inclusive Port Stephens adventure package. It includes a 9am parasail, 10:30am Dolphin Watch, 12pm Buffet Lunch and 2pm Sandboarding.